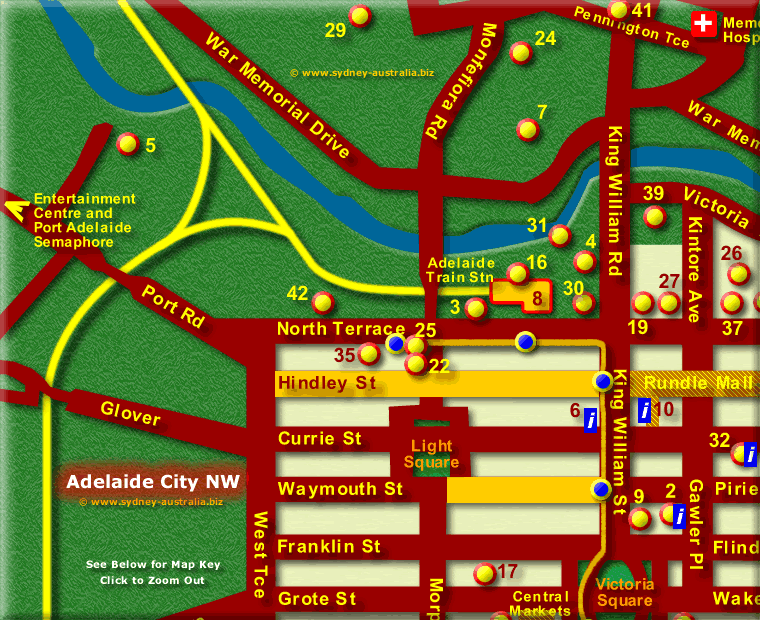 Main Map: Adelaide Tourist Attractions Map. See map key below. There are key attractions in this part of the city, including the Adelaide Entertainment Centre, just off the map further along on Port Road. The Cultural Precinct is located here, between the Torrens River and along Currie St, including the North Terrace and Hindley. Along North Terrace, Hindley Street and Rundle Mall, you can find plenty of things to do including shopping, as well as some fabulous dining. There are also clubs and pubs, and a number of good eateries of the take away variety. If art is your thing, check out the Arts District, also located between Hindley and North Terrace, on the north east corner. Here you will find the SAMSTAG Museum, which have 3d arts displays, changed on a regular basis. There are numerous other art galleries here, not least of them which is the Jam Factory. You can easily fill your day here, discovering all kinds of delights of contemporary craft and design. The Mercury Theatre, also located here, has a changing program of art movies as well as some of the latest blockbusters from all around the world. It also features a changing program of movies made right here in Adelaide! You can also find the Adelaide Festival Centre here, featuring music, dance, theatre and exhibitions. There is a whole range of entertainment for the kids and families as well, particularly during the school holidays and Saturdays. Rundle Mall has delighful and historical arcades, with major department stores as well as some 700 shops and boutiques. During the day there is a variety of free entertainment as well as in the early evening, making the mall a very lively place anytime of year. Next Picture: Adelaide Map - NE - Adelaide Map - NE. Previous Picture: Map showing Adelaide Places to Visit SW - Map showing Adelaide Places to Visit SW.
At Port Adelaide, you can find heritage and cultural attractions as well as the natural attractions along the foreshore. There are historical buildings and museums to explore. Take the Heritage Walking Tour, or the follow the Heritage Pub Trail. There are walks for the kids as well. Visit the Port Adelaide Information Centre for more things to do at 66 Commercial Rd, Port Adelaide. Phone +61 8 8405 6560. See more about the South Australia National Parks. Parks and reserves in Australia: National Parks and Reserves throughout Australia. Adelaide accommodation includes hotels, motels, luxury resorts, caravan parks, camping, bed and breakfasts as well as backpackers hostels.